The distinct endemic genera of birds challenges a widely held belief that India's avifauna were merely species within broad genera found outside India. Birdwatchers called six small birds in the Western Ghats by the wrong names for more than a century. What they called laughingthrushes were not laughingthrushes and shortwings were not shortwings. A recent paper unravels who these birds’ relatives are and how they evolved. Such discoveries are rare because birds are well-studied, and their classification holds no surprises. Until now. 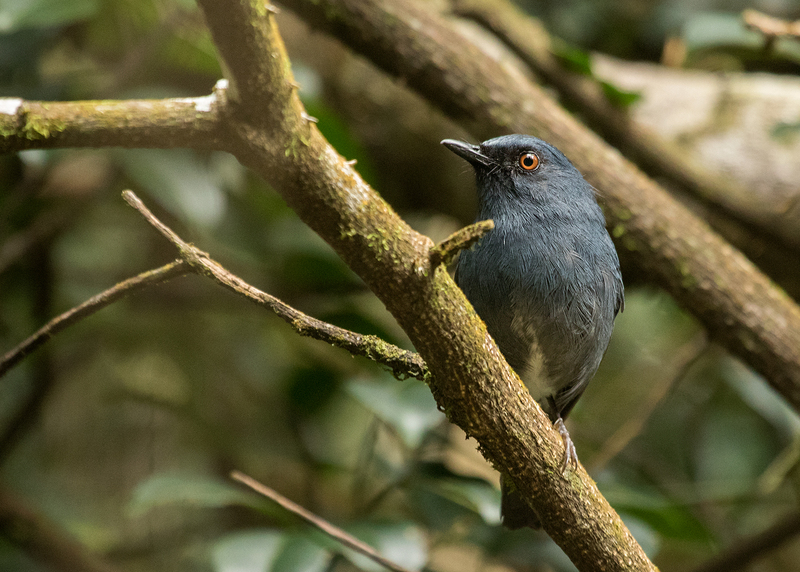 The erstwhile laughingthrushes and shortwings live in high-altitude cold, wet forests. Above an elevation of 1,500 metres, stunted evergreen trees grow in valleys surrounded by a sea of grassland. Called sky islands, these shola forests are as isolated from one another as sea islands. And this splendid separation spawns a diversity of species not only in frogs, lizards and snakes but also in birds that are found nowhere else. V.V. 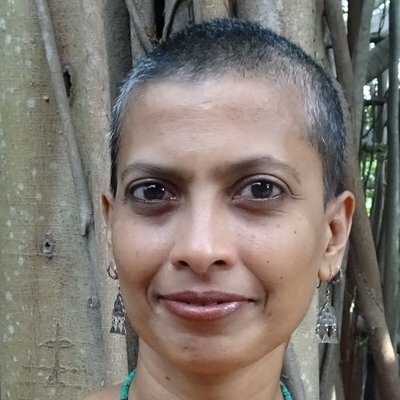 Robin, from the National Centre for Biological Sciences (NCBS), Bengaluru, and the Indian Institute of Science Education and Research, Tirupati, has studied shortwings for 15 years. In 2002, he figured out what kind of forests the white-bellied shortwing favoured. Although he spent more time in the lowland rainforests, he found many more of these little blue birds in the sholas. The 40-kilometre-wide Palghat Gap is an insurmountable barrier for many species of birds, reptiles and mammals. On either side of this break in the hill ranges live two subspecies of the white-bellied shortwing. By analysing differences in the songs of the two populations, Robin concluded they were two species. But nagging questions about other inconsistencies drove him to investigate further. He put together a multidisciplinary international team of collaborators that decided to focus on all sky island birds. Sushma Reddy, of Loyola University Chicago, specialises in babbler phylogenies of South Asia. Frank Rheindt, National University of Singapore, was the taxonomist in the group. Other collaborators included Pooja Gupta and C.K. Vishnudas, from NCBS, and Daniel Hopper, from the University of Chicago. Uma Ramakrishnan, also from NCBS, works on population genetics and evolutionary patterns of mammals across India. The project was based out of her lab. 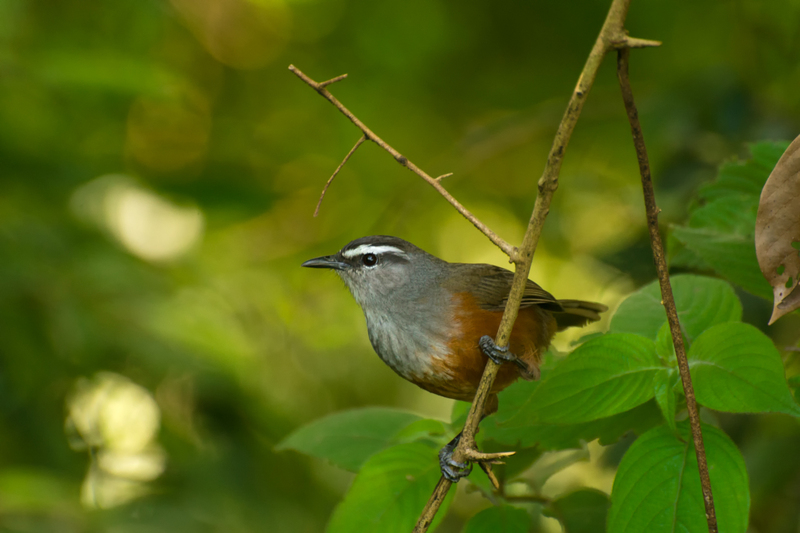 The researchers studied not only the white-bellied shortwing but also their close allies, the four species of laughingthrushes in the Western Ghats. They drew blood samples for genetic analysis, measured the beaks, wings and tails, analysed songs and examined the plumage of more than 350 laughingthrushes and 430 shortwings. Genetic analysis and comparing a wide range of stuffed specimens in museums, the researchers estimated who the birds’ closest relatives were. This is when they were in for a surprise. The shortwings’ closest relatives were blue flycatchers. And the laughingthrushes counted on sibias, minlas and barwings as their nearest kin. But they weren’t closely related enough to be clubbed with them. These diminutive birds were distinct enough to need new names of their own. Robin and his team named the Western Ghats shortwings as Sholicola in Latin (meaning ‘dweller of sholas‘) and Sholakili in common usage. Similarly, the laughingthrushes are Montecincla (meaning ‘songbird of the mountains’) or Chilappan (from Malayalam for its “joyful cackling calls”). Sholakilis and Chilappans are genera, or a collection of species, found nowhere else on the planet. “Discovering new diversity at the level of a genus in previously known species is rather like finding out that your parents were mistaken about their lineage and therefore you suddenly must take on a new last name!” says Madhusudan Katti, of the North Carolina State University. He wasn’t involved in the study. “We didn’t expect to find such dramatic results,” says Sushma Reddy. 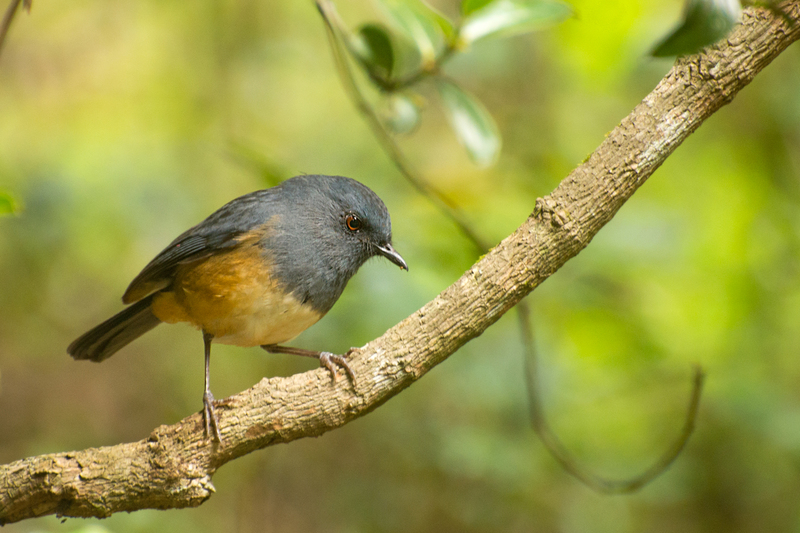 “From Robin’s 2010 work, we knew that shortwings didn’t belong with the genus they were classified in, but we didn’t expect to find them as a distinct branch of a group of Asian flycatchers.” Nor did they expect to classify laughingthrushes in their own genus. Although parts of India are called biodiversity hotspots, biologists don’t think the country is greatly diverse. “It’s more like a poor millionaire down the Forbes list,” says Robin. “The patterns and processes of speciation are not well described.” The distinct endemic genera of birds challenges a widely held belief that India’s avifauna were merely species within broad genera found outside India. “The astonishing results of this study certainly deepen my appreciation of and concern for biodiversity in the Western Ghats,” says Katti. “Given the long history of human occupation in the Western Ghats, and their popularity among birdwatchers, it is remarkable that no one had taken a closer scientific look at these birds until now.” The implication of this extends far beyond birds and the diversity of the western hill range. It reveals the evolutionary history of the Indian subcontinent. The closest relatives of Sholakilis, builders of nests from moss, and the flower and fruit-eating Chilappans live in the Himalayas and in Southeast Asia. Many other creatures living in the Western Ghats trace their ancestry to the great northern mountain range. How did they find they way across the vast inhospitable expanse of the country to colonise these wet southern hills? The ‘Satpura Hypothesis’ is the prevalent theory that explains the absence of relatives close by. It proposes that about 11 million years ago, during the middle or late Miocene Epoch, wet forests of the Satpura Hills in central India linked the Himalayas and the Western Ghats. Animals and birds made their way south through this forested bridge. In the following years, however, the subcontinent dried up, separating the southern and northern populations. According to genetic analysis, both Sholakilis and Chilappans separated from their Himalayan cousins 11 million years ago. Stuck in their forested islands in the sky, they started to evolve into separate species about five million years ago, precisely when the Satpura Hypothesis says the continental wet forests dried up. While the 500-million-year-old Palghat Gap is the biggest break in the chain of hills, the seven-kilometre-wide Shencottah Gap also stops animals from moving north or south. It allowed the Palani Chilappan and White-bellied Sholakili to evolve in the Anamalais and Highwavies about 1.5 million years ago. Considering these are small birds isolated to their high forest citadels, it’s astonishing that the same species live in these two separate ranges. Although Sholakilis prefer sholas above 1,500 metres, they are found in lower numbers down to 1,000 metres elevation. At this level, forests link Anamalais and Highwavies. Perhaps the Chilappan also followed the same forest bridge. South of the gap, the Ashambu Hills host their own Sholakili and Chilappan. During the course of the study, C.K. Vishnudas, one of the researchers, stumbled upon a long forgotten specimen of a little bird in the Trivandrum Museum of Natural History. Collected in 1903, it became the basis for describing a new species: the Ashambu Sholakili or Sholicola ashambuensis. Until now, everyone thought it was a different looking white-bellied shortwing. All these different species didn’t differ in their genes alone. Their plumage and body size didn’t resemble one another. Their songs varied in bandwidth, complexity and length. “It’s pretty hard to convince ornithologists that you have new species so we had to examine lots of different types of data – song, feather patterns, body measurements, DNA – to show these populations have unique characteristics and should be treated as separate species and especially genera,” said Robin in a press release. These seven birds live in the highest forests along a 400-kilometre stretch of the Western Ghats. Over 50% of these forests have been lost since 1850. The isolation that drove diversity may also be their weakness. The research was published in the journal BMC Evolutionary Biology on January 23, 2017.